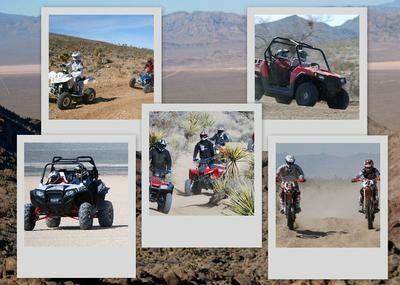 Come see isolated places in the Mojave Desert and enjoy one of the longest ATV adventure tours given in Southern Nevada. The tour begins with van transportation from your hotel to the staging area in Jean, Nev. where you be informed of important safety precautions. Then the real adventure begins. This tour is suitable for beginning and experienced riders. Jump on that ATV and start your excursion through the rugged desert and mountain terrain. Ride and explore through the remarkable Hidden Valley, where you will find extinct lava beds and dried up lakes. You will also take a journey through the McCullough Mountain Range for more trail riding. Your tour includes bottled water. The morning tour includes a stop in Primm, Nev. for a short break. While the afternoon tour offers the same ATV ride, it does not make a stop at Primm. Note: Guests should wear closed-toe shoes (no high heels or open-toed shoes allowed). Hats and sunglasses are recommended. For cooler temperatures, a long-sleeved shirt or jacket is recommended.